Translate the long-term VISION of the CIO/Board or Investment Committee into asset class returns. Focus on what matters in the long term. Identify structural long-term shifts in asset pricing and steer the fund away from over-valued asset categories. “On-the-fly” stress testing for major scenarios: BREXIT, collapse of China’s economy, Commodity Price Shock etc. Scenario impact estimated on the basis of real economic relationships and not historical statistical analysis. Transform the regulatory exercises into value-adding insights. In collaboration with Triple-A, LINKS delivers integrated scenarios for analyses required by regulation (ALM, Own Risk Assessment/ERB, ORSA). 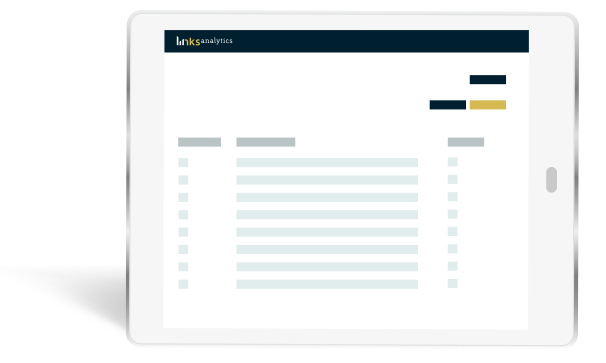 LINKS Analytics provides asset pricing, allocation, stress testing and scenario analysis innovative frameworks and related assistance to the largest pension funds and insurance companies in Europe, with combined assets under management of over EUR 450 billion. Reach out to us to discuss how Mira ABM can help you with long-term strategic decisions and near-term market stress. Leave us your email address and we will update you periodically on major global investment risks covered by LINKS and their severity.